The finely graduated flow values (kvs) of the new six-way control ball valves allow a great deal of planning flexibility since there is a suitable valve even for large rooms and high heating/cooling demands. All Clark Solutions 8P Series ball valve actuators feature a compact twin rack and pinion design and an adjustable 0-90[degrees] rotation. Ball valve prostheses; current appraisal of late results. The ball valves plant is the second investment by "O. Check the ball valve float for any holes and unscrew it to see if it is holding water. Gate valves end ball valves are available in PVC and CPVC. The HCV three-way high-pressure steel ball valves are also designed for mobile plant and industrial equipment applications and are available with SAE, NPT or BSPP thread configurations from 0. Now, the advent of high-tech, high-vacuum ball valves is a reality. 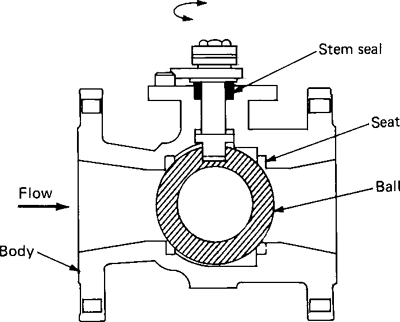 The ball valves can be configured either as on/off or modulating control valves from 1-in, through 6-in. A line of standard-port, end-entry ball valves designed for 1,000 psi service in 1 1/2-in, to 3-in. Markets Served: ball valves (95% captive) and valve castings (5% jobbing). Designed for improved cycle life in the field, the trunnion-style ball valves provide a leak-tight seal for applications up to 15 000 psig (1034 bar) and feature Swagelok's patent-pending direct load design, which delivers a more consistent seal across a full range of pressures.